Today there will be ECB Non-Monetary Policy Meeting and ECB President, Draghi will deliver a speech. 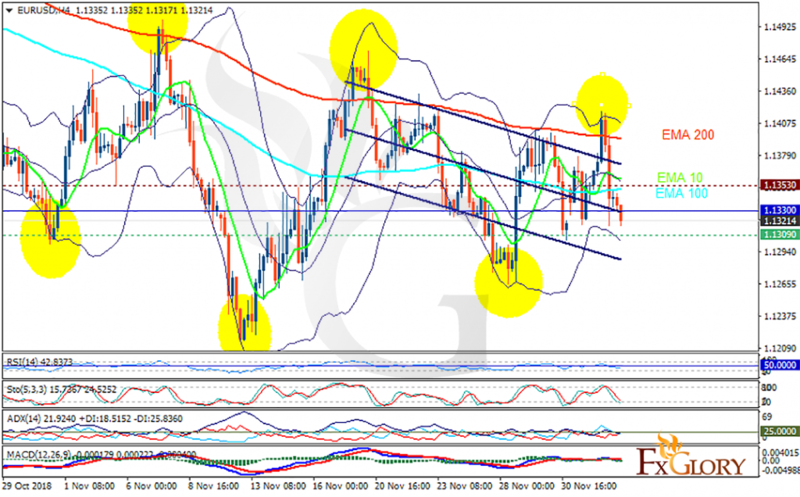 The support rests at 1.13090 with resistance at 1.13530 which the weekly pivot point at 1.13300 is located in between the lines. The EMA of 10 is moving with bearish in the descendant channel and it is above the EMA of 100 and below the EMA of 200. The RSI is moving below the 50 level, the Stochastic is moving in low ranges and the MACD line is below the signal line in the negative territory. The ADX is showing sell signal. The support level breakthrough may drag the price down towards 1.122, otherwise, EURUSD will grow towards the upper Bollinger band at 1.14.